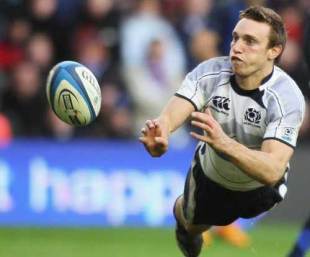 Mike Blair will make his comeback from injury for Scotland 'A' as they take on the Ireland Wolfhounds at Ravenhill on Friday night. Fresh from signing a new two-year deal with Edinburgh the Scotland co-captain starts alongside Glasgow's Ruaridh Jackson at halfback, having been out of action since November. Ulster's Simon Danielli starts on the wing on his home ground while Euan Murray will keep sharp after opting out of Scotland's Six Nations opener against France on Sunday due to his religious beliefs. Nick de Luca and Ben Cairns get the chance to press their claims for full honours while Ospreys wing Nikki Walker will have a point to prove after missing out on the main squad. "Last year, Scotland A enjoyed a huge amount of success - including the Nations Cup triumph in Romania - and only lost one match in 2009," said coach Sean Lineen. "Unfortunately that result was against Ireland A, so we are keen to set the record straight and produce a positive performance in Belfast. "All of the players involved are pushing for selection in the senior team and there is the right balance in the squad with youth and experience.